You may have heard in the news about the beheading of an American journalist by extremist, or saw it on Reddit or Huffington Post. 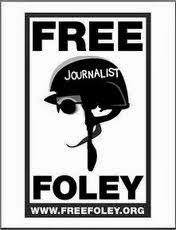 Jim Foley, the reporter at the center of this shocking story, was my classmate in the winter of 2007. We worked together at the Medill News Service in Washington, D.C. We went through foreign correspondence training together and edited each others' work. He was always quick to smile and faced challenges with an easy demeanor that caught on to everyone he met. My heart is heavy and my thoughts are with his family. Jim was kidnapped in 2012 from Syria while working to expose human rights violations. This kid was easily the bravest reporter I encountered in my time at Medill - after graduation, he took to the Middle East, fearlessly working to bring to light the tales of atrocities a world away. It certainly puts things into perspective - my career, my choices, my life. The world is a better place because of Jim, and his contributions will live on beyond this tragic turn of events. Oh wow! That's rough. I really have no words. It's a terrible thing. So sorry for your loss and for his family's loss. It was a sad day on Northwestern's campus today. Just horrific. It was a sad day on Northwestern's campus today for sure. Just horrific. I heard about this a few days ago, such a horrific tragedy. It must've been an honor to know such an incredible human being.